Today is a beautiful Sunday! Fall is in the air with high temps in the South running in the upper 60’s and I have stumbled upon newly found energy to do things around the house. Grass has been cut hopefully for the last time, cars washed, clothes are washing, I just finished vacuuming and I’m about to fire up the grill for dinner and make some tasty Asian grilled chicken thighs. You could use any cut of chicken, but we’ve been buying a lot of boneless, skinless chicken thighs. Not only are they reasonably priced, darker meat seems to have more flavor (along with more fat, but then again, fat IS flavor). The recipe for this dinner is all in the marinade and the longer it marinates, the better the flavor. I’m going to skip cooking instructions because the way you cook chicken is entirely up to you. I’ve roasted chicken this way and it’s been delicious, but today I want to take advantage of the weather, so I’m using the grill. Soak any chicken you prefer in the following, then simply cook and enjoy! 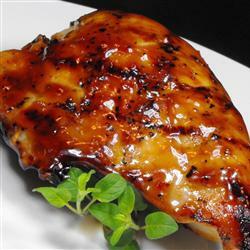 It’s also a great way to make “Teriyaki” wings for a tailgate! Combine all ingredients. Add chicken to big Ziploc bag, cover with marinade and put in the frig. The longer it marinates, the better, but at least 1 hour if you can’t let it go overnight. Discard the marinade and cook the way you’d like! This week, I’ve been enjoying some time off from work, so for dinner tonight, I decided I’d cook up a big “country” style dinner. Nothing says country like some fried food and nothing fries food as well as my great-grandmother’s iron skillets. I have no idea their age; she received them as wedding presents in the first decade of the 20th century and they weren’t new when she received them. They were passed to my grandmother and then to me, and I treat them like they were gold plated! They NEVER have seen the inside of a dishwasher, and only when I cook something like creamed corn, do I even put soap in them. Normally, they get a swish of hot water when the pan is still hot, then they are wiped out and dried off for the next use. Because of years of this kind of use, they are slicker than any non-stick pans available on the market today. Tonight’s dinner consisted of fried chicken, fresh lady peas, fried fresh okra, boiled heirloom potatoes with a little garlic butter, a pan of cornbread (must for a southern dinner) and a pitcher of sweet iced tea. 1. Find a bowl (or a pot if you don’t have a large enough bowl) that’s large enough to hold the amount of chicken you’re planning to cook. 2. Wash the chicken and place it in the bowl. Cover chicken with non-fat cultured buttermilk, and let it soak for at least 20 minutes. 3. Find a second large bowl or pot. Take the chicken out of the buttermilk and put into the second bowl. Using a 5# bag of flour (all purpose or self-rising, whatever you have on hand), pour the flour over the chicken. You need to use enough flour to totally incase the chicken. The chicken has to be embedded in this big bowl of flour, so yes, you’re going to end up wasting a good bit of flour in the end. Toss the chicken to coat well, sprinkle with salt and pepper, toss some more and then let the chicken stay in the flour for at least 20 minutes before frying. 4. 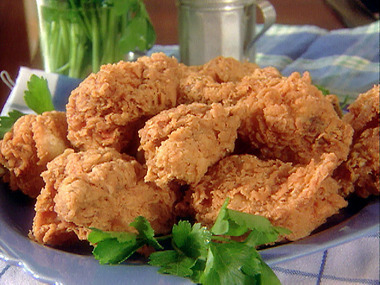 To fry the chicken, use either an iron skillet, large teflon coated skillet (if that’s all you have), a stock pot or a deep fryer if you have one. Get the grease good and hot. On the stovetop, I usually cook on medium high. In a deep fat fryer, 375F is ideal. To test and make sure your oil is hot enough, sprinkle a little flour in and see if it fizzles and bubbles. Cook the chicken in one even layer (if using a pan) for 8-10 minutes, then flip and cook 8 more minutes (actually your cooking time will depend on the thickness of your chicken and if it’s white or dark meat). White meat cooks faster than dark meat, so to make sure your chicken is cooked thoroughly, invest in a digital meat thermometer. White meat chicken is done when the internal temperature reaches 165F. Dark meat requires an internal temp of about 180F or it will be pink on the bones. Tip # 2.. DO NOT drain the chicken on a paper towel/plate. This makes the crust soggy. To keep the crust crispy and allow the grease to drain off, place a cooling rack (like you use for cookies) over a plate with a paper towel on the plate (in between the rack and the plate). Drain the chicken on the rack. That’s how we keep chicken crisp in the restaurants while holding for service and that tip works with anything fried with a crust. 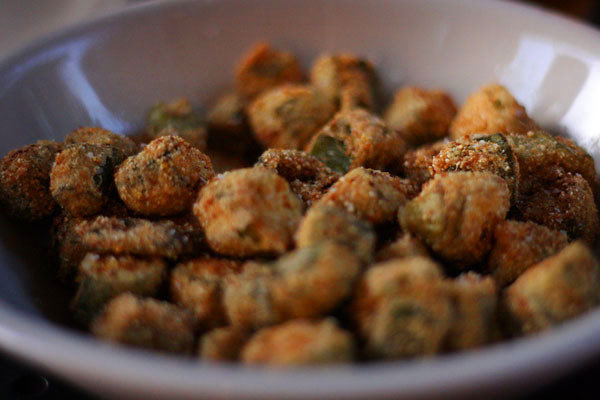 For fried okra, follow the same steps, but use cornmeal instead of flour! When you work in the foodservice industry, food cost is a big factor in determining weekly menus. Fine dining restaurants worry about food cost, but not nearly as much as corporate cafes like mine, where I’m serving food for a set price each day that I normally can’t change. So I’m always looking for ways to cook “lower cost” items… that’s how I came up with this recipe. At work, I make this recipe using chicken thighs, which are about the cheapest part of the chicken you can buy (not including organ meat, which I don’t do.. I’m no Hannibal Lector!! ), but this marinade is excellent on any piece of chicken. Breasts, strips and for game day tailgating, buffalo wings!! You can get away with a short time marinade for a few hours, but the longer you marinate the meat the better the flavor and the more tender and juicy the meat becomes. The sodium in the soy sauce “brines” the meat and anyone that’s cooked a big Thanksgiving turkey can tell you that brining is the way to ensure a juicy bird each and every time! So give this one a try sometime.. either for your next game day party, or simply for a low cost dinner at home with the family. ** I only buy low-sodium soy sauce and for this recipe I recommend you pick up a bottle. Because soy sauce is loaded with sodium, marinating overnight in regular soy sauce makes the finished chicken too salty. It’s like soaking a steak in Dale’s! Chop lower stem from cilantro and discard. Place cilantro tops, garlic cloves and fresh ginger in the bowl of a food processor and process to a fine blend. In a large storage container or large ziplock storage bag, add the processed ingredients, orange zest, orange juice, soy sauce, sesame oil and sesame seeds. Add the chicken to the marinade. Cover or seal and marinate for at least 2 hours, or overnight, in the refrigerator, turning every so often to ensure a good coating of marinade on the chicken. The longer it marinates, the more tender the chicken will become. Garnish with sliced scallions, fresh orange slices or minced parsley.